Call our team of experts on call on 0115 965 1937 for the best advice and our lowest prices or alternatively send us a multibuy enquiry and we’ll come back to you with our best deal. This clever air venting hob combines the hob and extractor for flexible installation. Offering four induction zones, you will be able to cook up all your favourites, and the integrated extractor will draw away any steam or odours with ease. Using Hob2Hood technology, the two components communicate so the extractor will automatically adjust, ideal for when you are concentrating on cooking! This model is suited for external ducting only and an alternate model for recirculation is available. Want to make an impact in your kitchen? 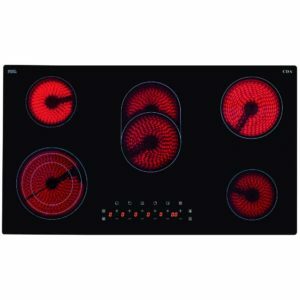 Then this superb 90cm wide Flexi4Zone induction hob from Smeg will be worth a look! Boasting five heat zones, with the option to combine zones for the ultimate in flexible cooking, automatic pan recognition, 14 power levels, boost and timer functions you can really cook up a treat! Finished in black glass with a bevelled front it is incredibly eye-catching and modern. Fancy yourself a chef? 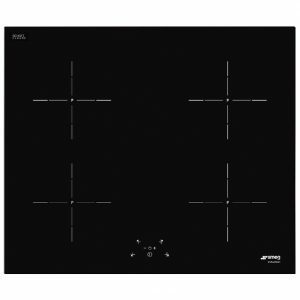 Take cooking by storm with the AEG HK955070FB 91cm ceramic hob. Five cooking zones, DirekTouch electronic touch controls and a stop and go feature assures that you'll never leave your guests less than impressed. Keeping your energy costs down, the residual heat optimisation on all five cooking zones and intelligent power usage makes this hob extra efficient. 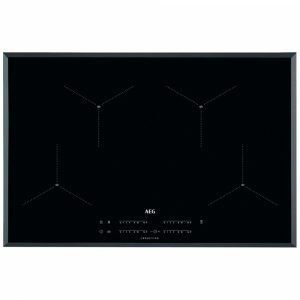 Finished in frameless black glass with bevelled edges this hob adds a stunning touch to any kitchen. 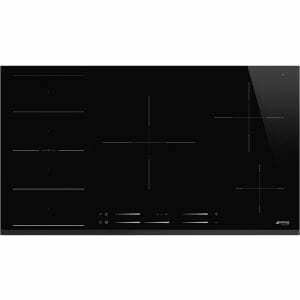 This superb 65cm wide dual zoneless induction hob from De Dietrich boasts 4 heat zones, 2 of which can be combined to create a DuoZone. With 7 functions, 20 power levels, a child lock and an auto safety shut off feature, this is the perfect hob for any family. It boasts functions such as auto heat up and boil, keep warm, simmer and sear for ideal cooking everytime. This model is finished in stunning black glass. With a seamless finish this hob is the perfect addition to any kitchen. 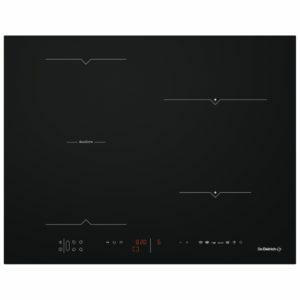 This Siemens 80cm wide air venting induction hob is a four zone induction hob combined with an integrated extraction unit. The ClimateControl sensor on this model monitors the steam and odours and adjusts the power level automatically. The induction hob features the Bosch CombiZone feature, allowing you to combine two induction zones into a large CombiZone. 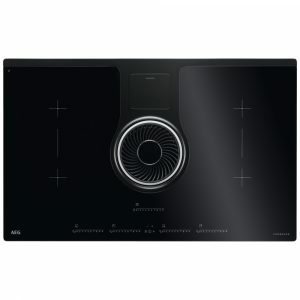 This SenseBoil induction hob from AEG boasts four heat zones. You can boil water without needing to constantly monitor it as the hob detects rising bubbles and reduces the heat to a gentle simmer. Another useful feature is Hob2Hood, if both your hood and hob have this feature it allows you to focus on cooking as the hob and hood connect with each other, creating the right amount of extraction depending on what you are cooking. MaxiSense self sizing cooking zones will detect your pans no matter how large or small and send heat to the required areas immediately. This is ideal for maximum flexibility in the kitchen. 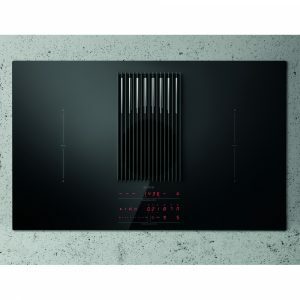 Finished in black glass with bevelled edges this 80cm wide induction hob will look great in any kitchen. 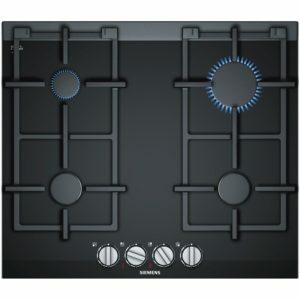 This stylish ER6A6PD70 60cm wide gas on glass hob from Siemens features four gas burners on a ceramic glass base teamed with contemporary stainless steel controls. With low profile single piece burners and cast iron pan supports it's very easy to keep clean and very stylish to look at. And as an added bonus, this model comes with a 2 year warranty. 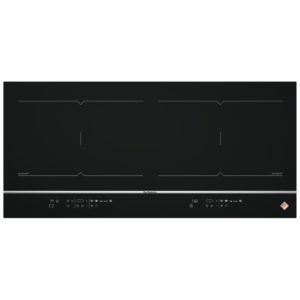 Looking amazing and boasting four heat zones, which can be combined in pairs to create HoriZones, this 93cm wide induction hob from De Dietrich allows flexible and powerful cooking. The HoriZones allow larger pans to be used so you don't have to feel restricted when cooking using griddle pans or even fish kettles. With easy to use touch controls and its stylish black glass finish it's a great addition to any kitchen. This stunning 60cm wide black glass induction hob from Smeg really makes an impact. With four heat zones and automatic pan recognition, it is loaded with handy features and is suitable for a 13 amp electrical supply. Finished in stylish black glass it will look great in any kitchen. Call Our Sales Team For Expert Advice! The stunning NikolaTesla Libra BLK DO from Elica is the first air venting induction hob equipped with integrated weighing scales. It has all the advantages of induction hobs, such as rapid cooking and easy cleaning, whilst following the steps of a recipe has never been simpler and faster. 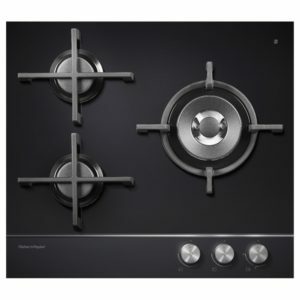 This superb 60cm wide gas on glass hob from Fisher Paykel boasts three gas burners with cast iron pan supports. Finished in black glass with a chrome pinstripe detail and turned metal control knobs it will look great in any kitchen. 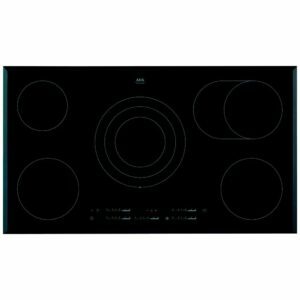 This superb 90cm wide ceramic hob from CDA boasts five heat zones. Finished in black glass it will look great in any kitchen. Your hob is an essential part of your kitchen. 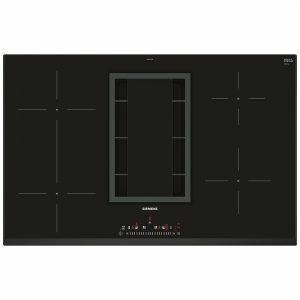 We have an amazing range of powerful hobs in stock for you to browse from on our website. With a variety of styles of cooker hood to match, we’ve got everything you need to revamp your kitchen. Check out our matching cooker hoods in our extraction section. From chimney hoods to ceiling hoods, we’ve got everything. For more cooking appliances, shop on our website. With range cookers, built in ovens and microwaves as well as our hobs, we’ve covered all the bases. Choose the right type of hob for your home. All your questions about hobs answered. Keep your hob looking its very best.